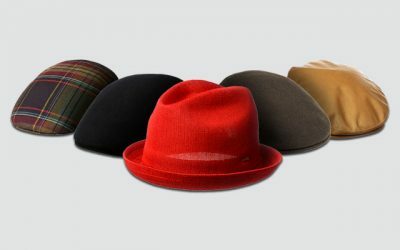 The pork pie hat is considered one of the most classic and traditional styles of hats for men for decades (You can check out other classic hat styles in this article ). A hat featuring the pork pie style would have a short crown with a flat top. The brim is quite small which can lay flat or slightly curve upwards. Men who are tall or have a rectangular face or an oval face would look great with this hat. If you think that a pork pie hat is for you, now it is time to shop for best pork pie hat for men. 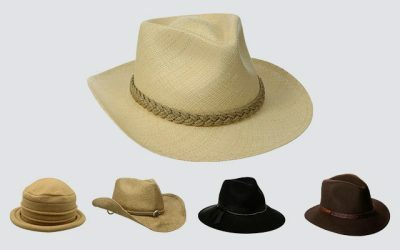 Just like choosing nay other hats on the market, you need to consider the material, the colors as well as the size to ensure you pick up the most suitable hat for all of your needs and requirements. We sum up the best pork pie hats on the market for you. The quality of these hats is undeniable. The thing that you need to do now is to pick up the one which meets your styles and requirement. 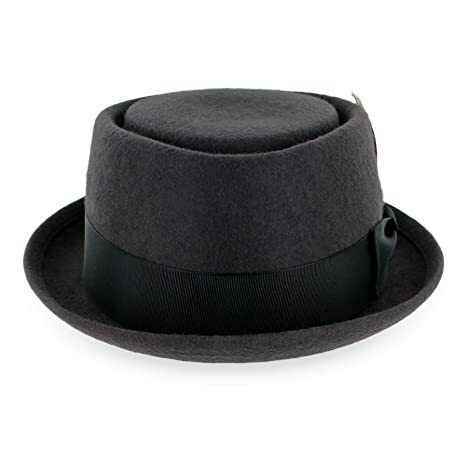 Its Main Features: This men’s pork pie hat is made of 100 % of wool felt body. The width of the stingy brim is 1.25 inches while the height of the telescope crown is 3.5 inches. It is available in 2 colors including dark grey and black. Undoubtedly this pork pie hat is made with high quality materials and an excellent craftsmanship. It is made from the high quality wool felt material which is soft and smooth. In addition, it is also well-ventilated to ensure that you will feel comfortable wearing this hat all day long. Thanks to the Dri-Lex sweatband which is made from bamboo material, the hat is even more absorbent and breathable. 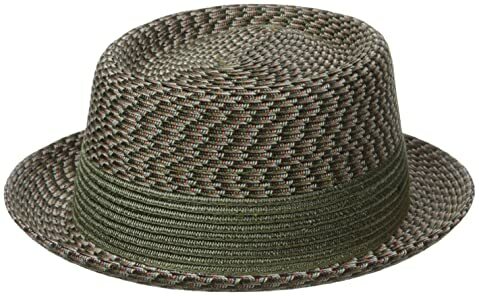 It is worth mentioning that with the bamboo material, the sweatband of the hat is anti-microbial and odor resistant. With 4 options of sizes, you will be able to find a perfect fit with this hat. It is also worth mentioning that this hat is made with an excellent craftsmanship for a solid and sturdy construction. The brim of the hat is reinforced with sturdy stitching lines to remain the same shape. Because this hat is made of wool, it is suitable to wear on a cool spring or autumn day rather than on a hot summer days. 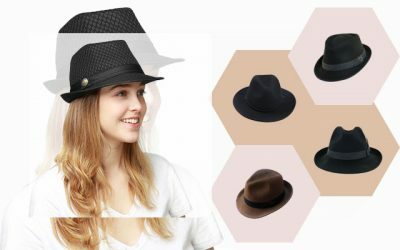 Thanks to its solid color and design, this pork pie hat is the one that you need if you are looking for a traditional pork pie hat to wear to formal or dressy occasions. 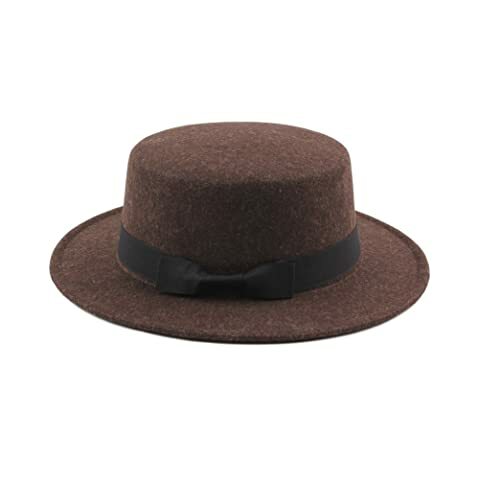 Its Main Features: Here comes another pork pie hat which is made of 100 % of wool felt. Besides the options of the black pork pie hat, you can consider other options including grey and brown. The width of the brim is 2.5 inches while the height of the crown is 4.5 inches. There are 3 options of sizes for your consideration including medium, large, and extra large which can fit the head’s circumference from 22.5 inches to 24 inches. 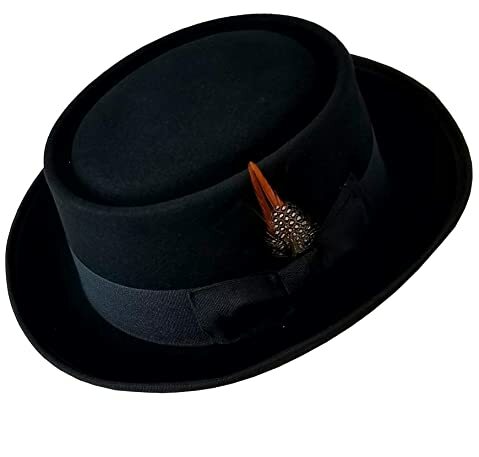 Thanks to the removable elegant feather, satin lining and leather band, this pork pie hat has a unique look that is different from other pork pie hat on the market. It is not of the formal pork pie hat style but rather a dressy hat that you can wear to proms, dressing, or musical or theatrical event. The decorate feather on the hat can be removed in case you simply don’t want it. It would be a challenge to find a leather pork pie hat but you can try this hat with a touch of leather from the elegant and high quality leather band. Besides the look of the pork pie, this hat also features the high quality material. It is not the best quality material that you can find on the market but it is certainly worth the price. It is nice enough for a costume hat. 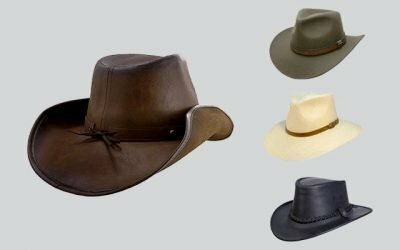 In addition, the brim of this pork pie hat is quite soft so that you can reshape the brim to different styles, perfect to an old west gambler hat. The brim of this hat is slightly larger than the brim of other pork pie hats. But it can be a good feature as it helps to cover a part of your face and protect it from the harsh sun rays. Its Main Features: This pork pie cap is made of 100 % of wool. There are 2 options of colors. If you like something colorful, go for the ultramarine color. On the other hand, if you like something more neutral, choose the forrester option. One of the most significant features of this hat is that it is made of the most premium wool that you can find on the market. This pork pie hat is made with LiteFelt treatment process so that the wool material which is used to make the hat is processed nicely and carefully. As a result, the wool of this hat is smooth and soft on the touch. 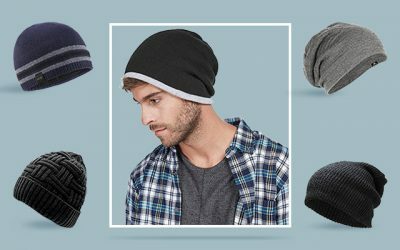 In addition, the wool material makes the fabric of this hat highly durable as it is water repellent and has a quick drying performance. Furthermore, this hat can retain its shape well even though you have been wearing this hat for a long time. In case creases appear on the hat, you can easily iron or steam it to make the fabric of the hat flat again. You can also fold the hat and pack it into a small bag for easy storage and carrying on. Another thing about this hat is that it is beautifully made with a custom metal pin logo. The logo is stitched nicely and firmly on the hat. The stitching lines of the hat are strong and sturdy for a solid and heavy-duty construction. 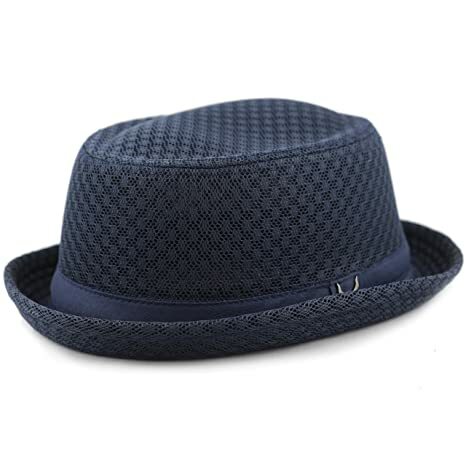 Its Main Features: This pork pie hat for men is made of 100 % of polypropylene. There are several options of colors for you to choose from including the Camo multi, grey, and black. This hat comes with custom color mixed braid along with a solid color contrast inset band. Thanks to the high quality nylon material, this hat is super tough and durable. 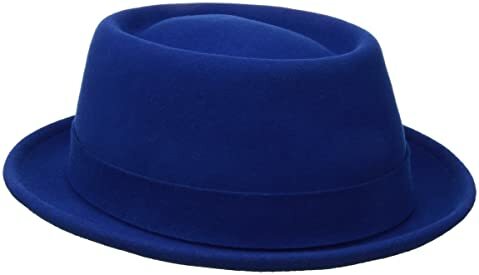 Even when you accidentally sit on the hat, it will just go back into its shape. You can also easily crush the hat and pack it into a small bag for easy carrying or storage. Also, this hat is slightly water resistant and has a quick drying performance so that you can enjoy wearing this hat when it is slightly rainy outside. Keep in mind that this hat might be heavier and not as well ventilated as a straw hat but it is surely tougher and more weather resistant. This hat is also well made with a solid construction that would stay in the same quality for a long time regardless of how many times you wear this men’s pork pie hat. In addition, this pork pie hat features an inner sweatband. This sweatband is made of cotton so that it is well ventilated and capable of wicking moisture away, which makes it comfortable for you to wear the hat on a hot summer day. This high quality sweatband also prevents your forehead from rubbing against your forehead to avoid irritation and itchiness as well. Its Main Features: The materials of this pork pie hat are 50 % of polyester and 50 % of cotton featuring a flat crown and a wide brim. It also comes with a grosgrain trim with a bow as decoration. This hat is available in 4 options of colors including coffee, black, camel, and grey. The headband of this hat in all of the options of colors is black. This pork pie hat is available in 1 size. The brim of this pork pie hat is 2.2 inches in width while the height of the crown is 3.5 inches. While the width of the brim is slightly larger than the brim of other pork pie hats that you can find on the market. Some of you might not like such a wide brim in a traditional pork pie hats. However, this can be good for you as well. A wide brim means that the hat can cover your ears as well as a large area of your face, protecting you from the harsh sun rays. In addition, the fabric of the hat is thick enough to protect your skin against the harsh sun rays. 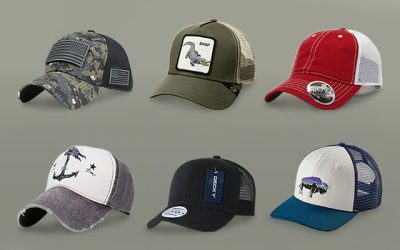 Not to mention that with the high quality fabric, the hat is lightweight and comfortable for you to wear in all kinds of weather throughout the year. This hat is not only functional but also very stylish. Thanks to its formal look, you can wear this hat to various formal events such as weddings, tea parties, church, and any other special occasion. Thanks to the solid colors, this hat will go well with any of your formal clothes. Its Main Features: This pork pie hat is made of 100 % of wool. It features the style of a short brim pork pie with a folded satin band and a feather as a decoration. It looks like a Heisenberg pork pie mixing with a Bogart fedora hat. You can also notice a custom Brixton pin with a metal Brixton ribbed shield. You can choose among black, coffee, and grey option of colors for this pork pie hat. The feather adds an elegant look to this pie hat and make sure it is unique and outstanding. Still, if you don’t like the feather of the hat, you can easily remove it without damaging the fabric of the hat. Thanks to an inner wire which runs along the outer edge of this pork pie hat, you can easily reshape the brim of the hat, for instance turning the brim down, for a different look. 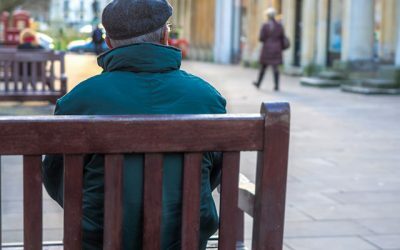 In addition, this hat brings a timeless look that will never go out of style along with some additional decorations that make it look trendier and more fashionable. You can wear this hat to a wide range of occasions- from weddings, churches to some special events like theaters or proms. This hat does requires extra care to ensure the quality and the construction of this hat remain as good as long as possible. You need to wash the hat by hand with cold water only. 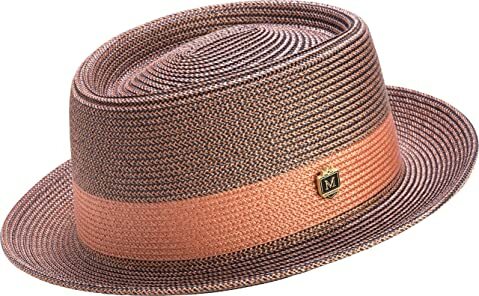 Its Main Features: This pork pie hat is made of 50 % of polyester and 50 % of cotton. 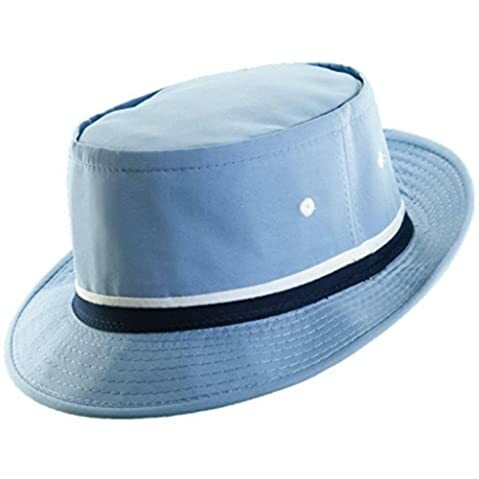 It features the modified pork pie hat with the design that resembles a bucket hat. There is a ribbon band on the hat as well. You can choose among 5 choices of colors including light blue, grey or white. There are 5 options of sizes for you to choose from ranging from size S to XL. Thanks to the high quality material of this hat, this hat is super comfortable and breathable. It is also lightweight so that it causes no pressure even when you wear the hat for a long time. While the fabric of the body of this pork pie hat makes it soft and smooth, the brim of this hat is stiff enough for you to reshape this hat to whatever style that you like. 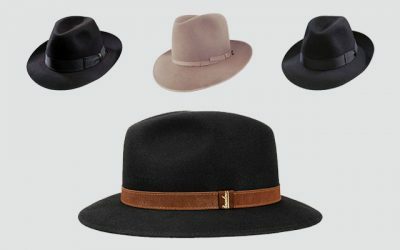 You can choose to wear with a brim up or pulled down in the front for a classic and timeless fedora hat look. 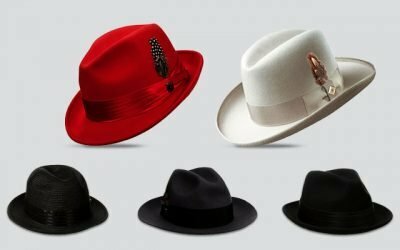 In case you are looking for a pork pie hat with a unique look that looks like no other pork pie hat on the market, this one is worth checking out. This hat will certainly add a unique twist to your wardrobe. Keep in mind that while most of the pork pie hats on the market are formal hats, this one is much more informal. You can wear this hat when you take part in various outdoor activities including camping, hiking, fishing, and gardening. Its Main Features: Here comes another pork pie hat which is made of 100 % of natural wool. There are 4 options of colors for your consideration including camel, black and grey. 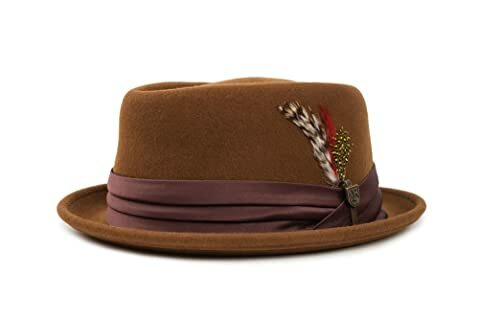 And if you are looking for a brown pork pie hat, you should also consider this option as well. It features a diamond pork pie crown with a wide brim of 2 inches. The design of this hat include a deco-stripe grosgrain hatband along with thin horizontal stripes for some visual effects. Like other high quality pork pie hats made from wool that you can find on the market, this wool pork pie hat is made of a sturdy and blocked wool felt construction. The body of this hat is firm and solid without being too stiff. Another thing that you will like about this pork pie hat is that it is made of the most premium quality wool material, which is the Melange “mix” wool. This type of wool is water resistant and durable. And while the body is made with a heavy-duty construction, you can crush the hat to pack it. When you take it out, it will spring back to its original form. In fact, the hat can hold its shape very well. And the wool is thick and warm enough to keep your head warm and comfortable in the winter. While the hat is thick, it comes with an internal sweatband, which is capable of wicking moisture away to keep your head cool and dry even when you have to wear the hat for a long time. The hat will not show dust easily. And you can easily clean it with a quick steam and brush. It is definitely a great hat for first hat wearer or for anyone who would like to have a hat to wear in all kinds of occasions. 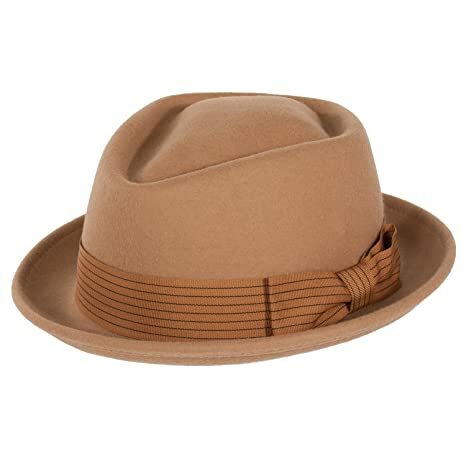 You can enjoy wearing the hat with the brim worn up or snapped down thanks to the shapeable brim of this pork pie hat. Its Main Features: Most of the pork pie hats we list above are made from wool or felt material. They are perfect materials for a formal pork pie hat. 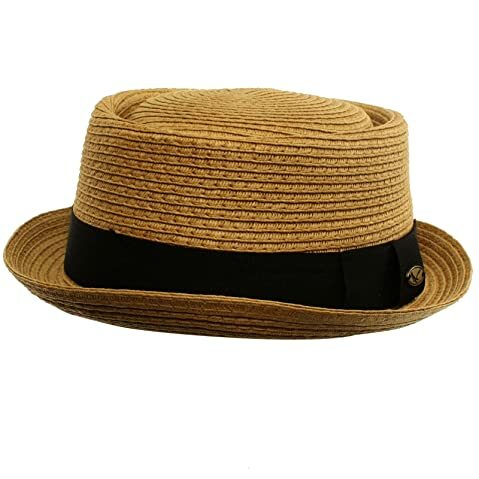 If you are looking for a slightly less formal pork pie hat, why don’t you take a look at some men’s straw pork pie hats like this one? It is made of 100 % of paper braid which is available in toast, black, white, and natural color. The head band in all options of color is black. The width of the brim is 1.25 inches while the height of the crown is 3.5 inches. There is a grosgrain ribbon hatband attached to the hat as well. You can wear this cool pork pie hat in the spring and the summer. With the premium quality, this hat is quite lightweight and comfortable to wear. In addition, it comes with an interior sweatband which helps to ventilate air and wick moisture away to keep your head cool all of the time. The fabric of this hat is also thick enough to prevent the harmful sun rays from damaging your skin when you have to go out in a summer day. The brim is slightly curved upwards but you can reshape it to whatever style that you want with this pork pie hat. The minor problem with this hat is that it is slightly larger than other pork pie hats that you can find on the market. Still, if your head’s size is above average, you might find this hat to have a perfect fit on your head. Its Main Features: This pork pie hat is made of 100 % of polyester. 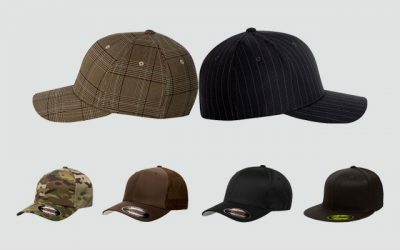 There is a wide range of choices for you to consider from with this hat including navy, khaki, grey, black, and purple. The height of the crown is 4 inches while the width of the brim is 1.5 inches. You can find this pork pie hat in various sizes that can fit the head’s circumference from 22 inches to 23.5 inches. This pork pie for men is made from the high quality polyester which is lightweight and comfortable. In addition, the polyester material is also durable and weather resistant. You can easily wash this hat both by hand or with the washing machine and the fabric would stay in the same quality. The hat comes with a crushable construction for you to pack it along with you when you go travelling. Still, it will spring back to its original form easily. 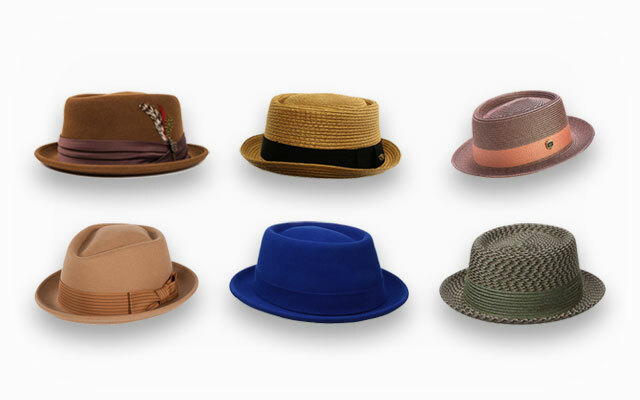 With a lot of choices for the colors, you can easily find the pork pie hat that you like. Not to mention that the colors are all so bright and vivid. They are also fade resistant to remain the same shade for a long time, regardless of how many times you wash the hat. This hat is so versatile that you can wear the hat to a wide range of occasions- when you hang out with your friends or go to a party. Its Main Features: It is made of 100 % of braided paper. This hat is available in 2 colors which are coral and hunter option. It features a head band of different color. The head band is quite big to form a two toned braided design. The brim is 1.75 inches width and the crown is 3.75 inches in height. It features a Montique pin. The brim of this hat is not so stiff that you can easily snap it up or down to form the style that you like. Besides, this hat is made with an excellent craftsmanship so that all of the lines are nicely cuts and the stitching lines are all done sturdily and carefully with no loose threads. Thanks to the premium material and the inner headband, this hat is so lightweight and well ventilated to keep your head cool during the hot summer days. The inner headband is effective in ventilate air well as wicking moisture away. In addition, it also helps to prevent your forehead from rubbing the tough braided material, which in turn, prevents irritation and itchiness on your forehead, especially when you have to wear the hat for a long time. A pork pie, like any other classic and dressy hats, is the one that can help you enhance your style and make you look like a real gentlemen for a special event. There are thousands of them on the market with different styles, materials, and colors for your consideration. For instance, you need to consider felt or wool material for a formal pork pie hat. 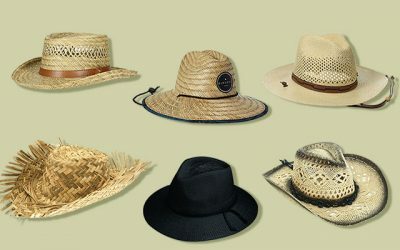 Or if you want the hat for more informal events, go for other materials such as polyester, cotton, and straw. 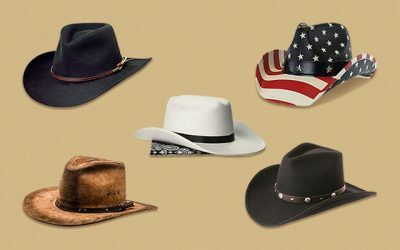 I hope that with all of the reviews, you can quickly find the hat that you like the most. A pork pie hat that you choose carefully will be a worthy investment that will last for such a long time.